This simple idea for a veggie side dish has been brewing for a few weeks. Finally, I got around to it, having an excess of raw carrots and onions around. It is sweet, but not overpoweringly so, with hints of spice and a deep, warm flavor. 2. chop, as desired. I like to do them at a slight angle as it lends itself to a raw, homemade feel with the angles from the peeling. 6. add maple syrup, sweet mustard, cloves, water, and then flour while stirring. 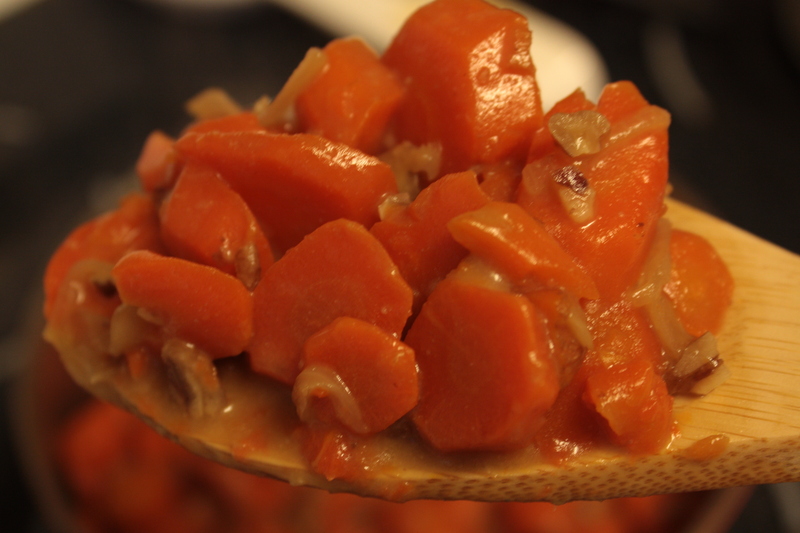 8. once carrots are tender, on low heat, combine sauce with the carrots and stir. 9. if there is any slight excess in sauce, you may boil it off for a few minutes. Goes nicely as a side dish with pork loin, or turkey.